The purpose of this paper is to revisit the Granger causal relationship between banking sector development and economic growth for forty developing countries in the period 1970–2012. In order to capture the different aspects of banking sector development, we use two banking sector development indices and apply a panel bootstrap approach to Granger causality testing which takes into account cross-sectional dependence and heterogeneity issues. 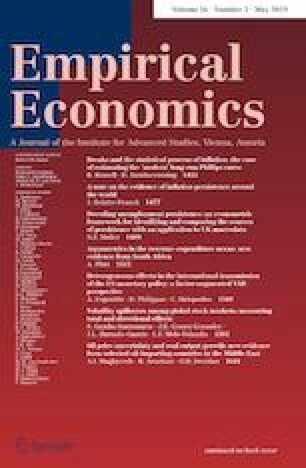 The empirical results show limited support for the supply-leading, demand-following and complementarity hypotheses, but provide evidence for a causal relationship between banking sector development and economic growth in twenty-five countries. The banking system’s share of GDP is computed from various issues of the UN National Account Statistics, New York, referring to “finance, insurance and business services.” The number of banks and branches is counted from the corresponding editions of the Bankers’ Almanac and Yearbook, London: Thomas Skinner; labor force data (for normalization) are from ILO and included in the Penn World Tables. The share of labor employed in the banking system is taken from various issues the ILO Yearbook of Labour Statistics, Geneva. The corresponding ISIC-2 (“International Standard Industrial Classification of All Economic Activities,” 1968) classification is “majordivision 8” (financial institutions, insurance, real estate and business services).